Accepta’s innovative rapid Legionella detection test kit uses the latest “quick-test” technology to allow the rapid in-field detection of Legionella pneumophila sero group 1. 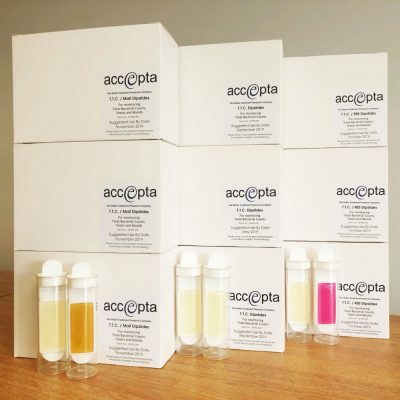 Accepta’s rapid Legionella tests are multi-use analysis kits designed for all types of waters including cooling towers, domestic hot and cold water systems, showers, water features and many more applications where Legionella bacteria present a risk safety and health. Accepta’s rapid Legionella detection test kit uses an immunochromatographic assay to detect within 30 minutes the presence of cell surface antigens from Legionella pneumophila serogroup 1. The presence of the antigen in the water causes the “Test Line” to turn red in colour. A “Control Line” is included which should always turn red if the test has been performed correctly. 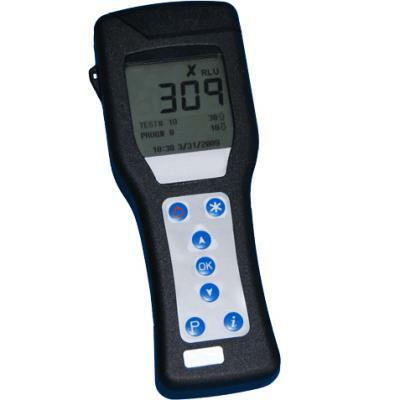 The kit includes 5 tests and has been designed to test waters to a sensitivity of 100 CFU/L. It is ideal when access to laboratories is impractical or speed is imperative. It should be used to supplement your existing sampling programme and should not replace routine laboratory analysis. Tested against a wide range of waterborne bacteria, including Acinetobactercalcoaceticus, Aeromonashydrophila subsp. hydrophila, Bacillus subtilis, Burkholderiacepacia, Citrobacterfreudii, Citrobacterkoseri, Escherichia coli, Enterobacter cloacae, Klebsiellaoxytoca, Pseudomonas aeruginosa, Pseudomonas fluorescens, Pseudomonas putida, Pseudomonas stutzeri, Ralstoniapickettii, Raoultellaterrigena, Streptococcus pyrogenes, Yersinia ruckeri. No cross reactions observed at concentrations > 109 CFU/L. Staphylococcus aureus has been observed to cross react with the test at concentrations > 108 CFU/L. Legionella pneumophila sero groups 4 & 7 cross react with the test at concentrations >109 CFU/sample. The test does not react with any other L. pneumophila serogroups or L. species tested. Sample should filter in less than 10 minutes. The product has been tested with a range of common biocides and iodispersants used in Legionella control, at their normal maximum perating concentration. Active ingredients tested include: lutaraldehyde, didecyl-dimethyl-ammonium chloride, isolthazoles, dibromonitrilopropionamide, ionic and non-ionic surfactants. The test gives a false positive if used with polymeric biguanide or THPS. 18 months from manufacture when stored at room temperature (<30°C) in original packaging. First time users should purchase RLeg60050. For further tests purchase RLeg60050F or single components. 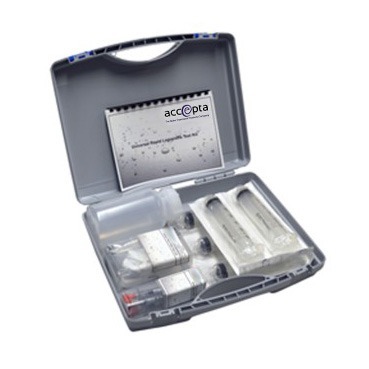 If you require additional information or specialist technical support concerning our rapid Legionella test kit please contact Accepta’s technical support team.